We spend hours in them every week. During which we drop a substantial amount of our paychecks, and make (often rash) decisions that have ripple effects on our health long after we leave. But despite how many visits we make to the local bodega, big-box chains and our go-to grocery store, little thought actually goes into how we navigate them. Besides messily jotting down the staples we need, we go in blind, wandering through our routine path down the aisles, tossing in a bunch of items and finding the shortest check-out line. But what if we told you that you’ve been shopping all wrong? It’s time to hack your grocery trip with these smart tips for navigating the store more efficiently, making better (re: cheaper) choices and getting out of there (and back to your scheduled weekend programming) as quickly as possible. It’s counter intuitive, but it’s true. Getting in line behind the lady who is buying out the entire produce section will actually get you checked out the fastest. The science behind reducing your time in line is called Little’s Law, which states that the length of a queue is equal to how long each interaction takes times the number of people or things coming in. So, if you choose a line with lots of people each carrying a few items, the fixed costs (i.e. the interaction between each customer and the checkout clerk) add up with each additional person, but if you choose a line with fewer people that each have more items, the fixed costs are kept low, and you can get through quicker. When wandering the aisles grabbing staples, we tend to focus straight ahead, grabbing the first can of black beans we see. But brands pay for shelf space, so the items that grab your attention front and center aren’t necessarily the most economical choices. Store brands and other generic brands, which tend to be cheaper but almost identical in ingredients, are placed on the bottom shelf. “Eye level is buy level. Products positioned right in front of you are likely to sell better, so make it a point to shop the lower and higher levels of the shelves to find the best deals,” says Smith. The number of items on the shelf is planned: Stores want to maximize their sales and provide the top-selling brands with more space. Regardless of what store you’re in, the shelf organization tends to be the same. On the bottom shelf you’ll find store brands, other generic brands and bulk items (aka the savvy shoppers bread and butter). The middle shelf is reserved for leading brands and best sellers (often sold to manufacturers for a fee) and the top shelf is typically local, gourmet and smaller brands. Skeptical of going generic? Smith recommends checking the ingredients or materials list before purchasing a generic brand to be reassured you’re getting the same product. You’re casually walking down the toilet paper aisle when a bright yellow sign catches your eye. It’s your lucky day, your go-to brand is on sale. But as you near the shelf you notice a large gaping hole where the rolls should be. It seems the other extra-soft fans beat you to it. But instead of accepting defeat and grabbing a (full-price) pack of another brand, ask for a rain check. What does this mean exactly? When it comes to cashing in on savings, be sure to also find out if your grocery store has special discount days for bread and meat. When it comes to those staple items that always make the grocery list there’s a rule of thumb to follow: Buy in bulk. “Things like yogurt, tissues, paper towels, ice tea, potatoes and apples can be purchased separately or in bags or multipacks. It almost never pays to buy singles, which can boost your cost by 40 percent or more,” says Lisa Lee Freeman, savings expert at Flipp app. How do you know if buying in bulk is really a better deal? “Check the unit prices on items that you are comparing. This will help you to see that the cost-per-unit on one item may be less than the cost-per-unit on a comparable item, which would mean a better deal for you,” says Tiffany Welka, accredited wealth management advisor with VFG Associates. We know, those little hummus packs perfectly paired with baby carrots are a god-send on a frazzled Monday morning. But you’re paying a major premium for that convenience — which with a little forethought (and a Tupperware container) couldn’t be easier to do on your own. Instead of paying more for snack-sized items, buy the largest size possible, which tends to be the best deal (see: cost per unit). The same goes for other convenience items like pre-washed bags of salad, pre-cut veggies and sliced chicken. Always go big and whole — and cut and package yourself. You know to put your blinders on while you’re waiting in the checkout line — with magazines and candy bars calling your name. But that isn’t the only place in the store that you need to be on high alert. “Everyone knows that the checkout line is a trap. Candy, soda, mints and magazines. These point-of-purchase displays are designed to get us to add a handful of high margin items to our cart at the last minute,” said Ian Atkins, Financial Analyst FitSmallBusiness.com. “What’s less well known is that the entire grocery store is designed the same way. The temperature, the music, the displays — everything is designed to encourage you to buy more, buy higher margin products and buy items that were not on your list. Stick to your list or risk falling for the checkout line trick,” Atkins adds. 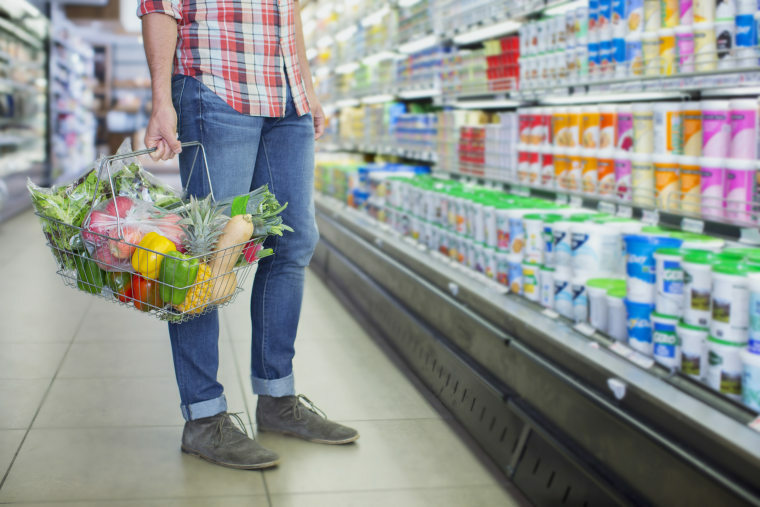 In addition to staying focused on your list, Dr. Paul Harrison, Chair of Consumer Behavior in the Department of Marketing at the Deakin Business School, says to be wary of displays placed in the perimeter of the store and at the end of aisles. Leading brands are placed strategically in high trafficked areas, like the perimeter since people tend to use it as a home base. (That explains the random cracker display in the produce aisle.) The products with the greatest profit margins, or those that have paid a premium, will be placed at the ends of aisles in end cap displays, says Harrison. Those free bites of cedar-planked salmon aren’t just being offered out of the goodness of your grocery stores heart. There is strong scientific evidence behind the ability of samples to coax more money out of your pocket. “Reciprocity is a very, very strong instinct,” Dan Ariely, a behavioral economist at Duke University, told The Atlantic. “If somebody does something for you, you really feel a rather surprisingly strong obligation to do something back for them.” Like grab a jar of that tomato sauce ladled over your tiny cup of penne. A 2011 study in the British Food Journal looked at the practice of putting out free samples. What they found is that majority of us aren’t very good at declining the offer when shopping. In fact 75 percent of those surveyed took the free sample when offered one. Once you’ve taken a bite, you’re not only more likely to switch from your habitual brand if the item was already on your list (which, chances are, is costing you more money), but you’re also more likely to buy the item if it wasn’t originally in your plans (which is definitely costing you more money). The researchers also found that people were more likely to purchase the product they sampled if the station was manned by a person — which supports Ariely’s hypothesis that our guilty conscience kicks in when someone gives us a taste test for free. So the next time you spot an employee offering up chocolate chip cookies, clutch your wallet and make a beeline for the exit.